The museum’s popular patrol boat has a significant birthday coming up next month. A volunteer who helped build her tells her story. An Attack-class patrol boat of the Royal Australian Navy, HMAS Advance (83) was constructed during 1967 and commissioned into the RAN in 1968. She operated from Darwin and patrolled northern Australian waters for more than a decade, before becoming both a TV star and a training ship. After being decommissioned on 6 February 1988, Advance was transferred to the ANMM, where she remains. As records show that HMAS Advance was officially commissioned on 24 January 1968, she will turn 50 on 24 January 2018. The patrol boats had a displacement of 100 tons at standard load and 146 tons at full load, were 107.6 feet (32.8m) in length overall, had a beam of 20 feet (6.1m), and draughts of 6.4 feet (2.0m) at standard load, and 7.3 feet (2.2m) at full load. Propulsion machinery consisted of two 16-cylinder Paxman YJCM diesel engines, which supplied 3460 shaft horsepower (2580kW) to the two propellers. The vessels could achieve a top speed of 24 knots (44km/h; 28mph), and had a range of 1200 nautical miles (2200km; 1400mi) at 13 knots (24km/h; 15mph). The ship’s company consisted of three officers and 16 sailors. Main armament was a bow-mounted Bofors 40mm gun, supplemented by a .50 calibre M2 Browning machine gun and various small arms. The ships were designed with as many commercial components as possible. The Attacks were to operate in remote regions of Australia and New Guinea, and a town’s hardware store would be more accessible than home base in a mechanical emergency. Before fit-out of the superstructure (pictured below) could start, a full-size timber model was made in a Brisbane workshop, and all the required equipment was fixed in place to ensure it would fit and be accessible. Once this was completed, final drawings were made and these were used by both shipyards for final fitting out. 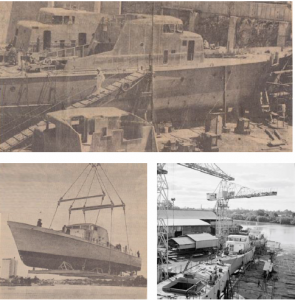 During construction of the first boat, HMAS Attack, in Brisbane, the weight of every piece of equipment taken on board and any removed was recorded. The person given this task took his job very seriously. Unfortunately, this resulted in many misunderstandings, especially when a large item such as engine cooling piping was taken on board to check if it fitted and then taken back to the workshop for adjustment. Regardless of size, the weight of everything was recorded going aboard and again if it came off. The shipyards used different assembly and launching techniques. Evans Deakin assembled their boats in a “dry dock” situation (below) and launched them by crane at any convenient time (bottom left). Walkers assembled and launched their boats on a conventional slipway (bottom right). Because the shipyard in Maryborough was on the Mary River which was affected by the rise and fall of the tide, some launches were conducted at night to coincide with the high tide. HMAS Advance, for instance, was launched at 8pm on Wednesday, 16 August 1967, by Mrs F.L. George, wife of Rear-Admiral George of the RAN. Following fit-out, sea trials were conducted in Hervey Bay on 16 January 1968. Due to tidal conditions the boat left the shipyard very early in the morning to travel more than 50 kilometres down the Mary River to reach the bay. Following the trials, if all was successful or only minor adjustments were necessary, the boat would berth at the Urangan Pier until it was handed over to the Navy and formally commissioned. Building at Walkers Limited: Maryborough, Qld, compiled by J.A. Concannon, HMAS Advance was handed over to the Navy on the same day as the sea trials 16 January 1968. The handing-over process consisted of a team of naval overseers accepting the boat on behalf of the Navy. The Navy then prepared for the formal commissioning. This took place at the historic Urangan Pier (pictured left) on 24 January 1968. Advance operated out of HMAS Coonawarra in Darwin, Northern Territory, between 1968 and 1980. As well as the standard duties for her class, Advance was also used for surveillance, search-and-rescue, and hydrographic survey (in company with the survey ship HMAS Moresby). During 1968, Advance and sister ship Attack shadowed the Soviet trawler Van Gogh, which operated in the Gulf of Carpentaria for two months. During 1975 and 1976, Advance regularly operated as part of Operation Trochus: a concentrated effort to respond to illegal fishing vessels in northern Australian waters. From late 1977, Advance was assigned to HMAS Waterhen in Sydney for patrols along Australia’s eastern coast but was redeployed elsewhere when necessary. In 1979, Advance was one of two Attack-class vessels used to portray the fictional HMAS Ambush, setting of the ABC television series Patrol Boat. Following her replacement by a Fremantle-class patrol boat in 1980, Advance was reassigned as a training ship. She was assigned to the Sydney Port Division of the Royal Australian Navy Reserve in February 1982. Advance participated in the 1986 Naval Review. 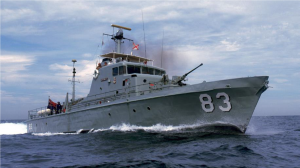 Advance was decommissioned on 6 February 1988 and was transferred to the ANMM. In October 2013, Advance participated in the International Fleet Review 2013 in Sydney, celebrating the centenary of the Royal Australian Navy. The vessel is on permanent exhibition and is enjoyed by many visitors to the museum. The boats Aitape, Ladava, Lae, Madang and Samarai were built for eventual hand-over to the Papua New Guinea Defence Force. This occurred on 14 November 1974 after PNG gained independence from Australia. The following were progressively transferred to the Indonesian Navy: Sibarau (ex-Bandolier), Siliman (ex-Archer), Sigalu (ex-Barricade), Silea (ex-Acute), Siribua (ex-Bombard), Siada (ex-Barbette), Sikuda (ex-Attack), Sigurot (ex-Assail), Tenggiri (ex-Ardent). Of the remaining six, Advance is the only one operational in Australia. 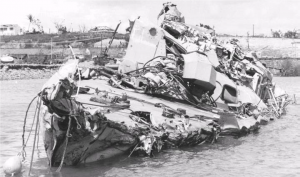 Arrow was destroyed by Cyclone Tracy; Aware was eventually scrapped; Bayonet was scuttled; Adroit and Buccaneer were sunk as target practice. The author worked as foreman electrician at Warburton Franki, Brisbane, on patrol boat electrics, 1966 to March 1968. From March 1968 to February 1969 he was a naval overseer at Maryborough, Qld. In the final months of and in the years after World War Two, many resources, documents and records relating to Royal Navy camouflage were purposely destroyed. That there might have been future value in these resources was either not recognized or deemed unimportant. In the decades in between then and now, several researchers have attempted to piece together from old samples, eye witness accounts and photographic records, a view on what the Royal Navy’s colour palette was during the years 1939 to 1945. The authors’ motivation for writing this work stems from trying to reconcile contradictions in extant references and various anachronisms evident both in other published works and common belief as compared to formal documentation. This work deals with the shades 507A, 507B and 507C, before moving on to the shades G10 and G45 which emerged in the 1943 series of Royal Navy camouflage colours. All colour measurements made in the preparation of this paper were carried out using a Nix Pro Color Sensor; a hand held digital device with its own calibrated light source and which is operated using a smart phone application. This made it possible to take digital readings of extant samples in controlled environments where it was not possible to bring the samples to desk-top spectrophotometers. The author’s Nix sensor has been checked against published standard colours as well as spot checked against Sovereign Hobbies Colourcoats factory’s desk mounted spectrophotometer. The authors trust that the methods, discussion and references made herein will be found to be a robust argument by the reader, and that based upon this writing the reader will be better equipped to both recognize 507A, 507B, 507C, G10 and G45 by time period, their common uses with other shades comprising typical Admiralty schemes and understand the nature of these colours. The authors would like to extend thanks to the staff of The National Archives at Kew in London, along with Heather Johnson, Curator (Archives) of the National Museum of the Royal Navy, Portsmouth, and also a special thanks to Richard Dennis who provided a wealth of documentation directly relevant to this paper. This research would not have been possible without the accommodation and willingness of all these sources of primary source references. The first known reference to a Pattern 507 grey paint is in 1902. This was a dark neutral grey comprising only black and white pigments. Sometime before WW1 a darker-still Pattern 507A was introduced, then a 507B as a distinct (lighter) shade in 1915 and a lighter-still 507C in 1916. The neutral-hued 507B & C continue until 1926, but at some unknown time after 1919 and before 1931 (probably 1926 also) both the original Pattern 507 and 507A greys were discontinued. 507C was the first to gain Egyptian Blue pigment in 1926, with 507B gaining blue pigment the following year. 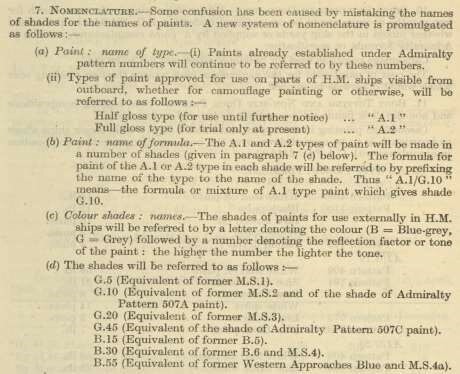 In order to achieve uniformity of painting of ships a 1933 Admiralty Fleet Order (AFO) 1776 (NS1221/33) (27/07/33) introduced blue/black pastes in place of separate blue and black ingredients. 1 gallon Dark Grey Enamel Patt 11 of similar shade to be added to each 100wt. Add turpentine sub to tin of Blue/Black to ensure full removal. There were adjustments made to the blue-black pastes in changing from Egyptian to Ultramarine Blue through the mid 1930s, with revised formulae given to maintain the intended shade. By 1936 we see the 1939/early war formulations arrived at, as published in AFO 2680/36 (NS 3501/36) (05/11/36). 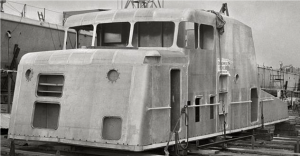 In January 1939, a Pattern 507A grey paint was introduced but, as the AFO makes clear, it was the same shade as 507B. It is important for context to understand at this point at two enamel paints were also available and documented at this time, given the identifiers Pattern 11 for the Dark Grey to Home Fleet shade and Pattern 12 for Light Grey. Dark grey paint, Home Fleet shade, for other than weather work, is being added to the Authorised List as Pattern 507a. The formula is the same as Pattern 507B except that the enamel is omitted. The description of Pattern 507B has been amplified to read:- “Paint mixed, dark grey, Home Fleet shade, for weather work”. 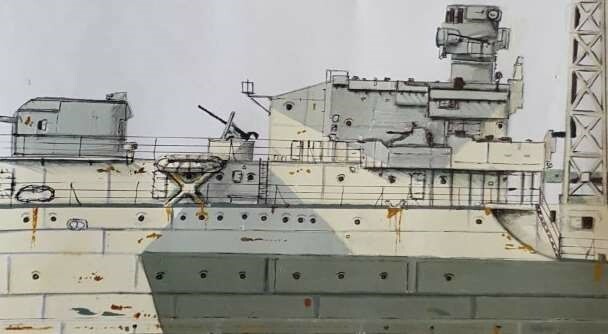 We see in this important AFO that Pattern 507A and 507B are both Home Fleet shade and featured identical pigmentation, only including or excluding the enamel paint and intended for different parts of the ship. Effectively this would have suspended 507B shortly thereafter and this was confirmed in AFO 4074 Economy in the Use of Zinc Oxides (D.8136/41 – 18. 9.1941) which explicitly discontinued the use of 507B during the period of hostilities. In general, there have been claimed original paint samples held by various researchers over the years which have been identified by them as 507A, 507B and 507C respectively. 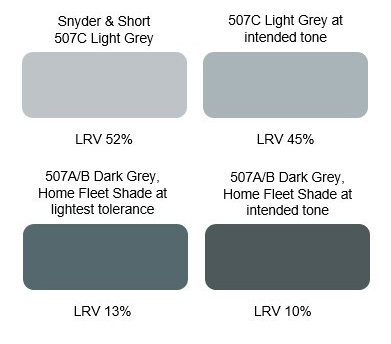 The authors are unsure as to exactly where or when the widely held belief that 1930s and 1940s 507A and 507B were “Dark Grey” and “Medium Grey” shades respectively originated, but it seems to be a belief which gathered followers in the 1970s and has been consolidated and repeated since. We have found no evidence in primary source references to support this idea, and plenty of primary source references which directly contradict it. Based on the available references used in compiling this work, the authors believe that the early WW2 era patterns 507A and 507B were the same colour, known to the Admiralty as “Dark Grey, Home Fleet shade”. The only difference was the surface finish of the two, with 507B containing a proportion of enamel paint as described earlier making it somewhat glossier than 507A. The 507 family of paints in the mid 1930s to 1940s are all low saturation blues, not neutral greys. The National Archives at Kew, London, hold a number of original documents in a strictly controlled fashion. This assures the integrity of the document and in this case, the authenticity of the paint samples. Amongst the documents reviewed, ADM212/124 Standardisation of Admiralty camouflage colours dated to 1942 contained genuine 507A and 507C samples. These samples were in the form of painted chips adhered to annotated leaves of thin paper. It is considered highly unlikely that this document has been tampered with given the control exerted by the National Archives on this record and the fragility of the backing paper. 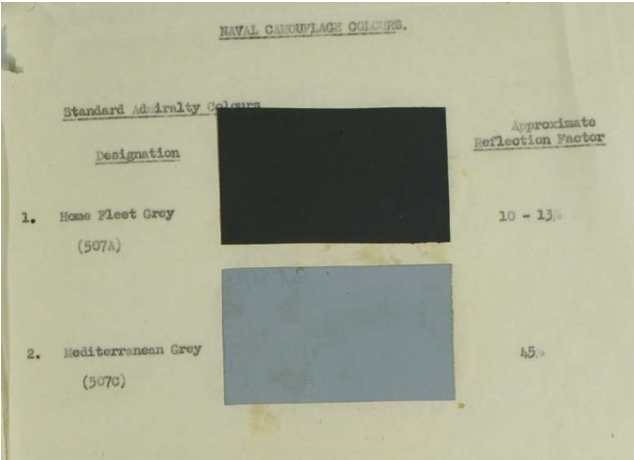 This document compared reasonably well physically with Colourcoats RN01 507A Dark Grey, and the Snyder & Short Royal Navy chips 507A sample that Colourcoats was originally based on but was slightly darker. This places the Kew sample, itself 75 years old at time of writing, below the lower end of the stated tolerance of Light Reflectance Value at approximately 7%. The 507C sample was similar in character to the Colourcoats RN03 507C Light Grey and hence Snyder & Short 507C sample, but quite noticeably darker. It is noteworthy that ADM 204/2737 stands alone in quoting the LRV of 507A as being a percentage of another paint. The other sources either omit this statement, or expressly state that they are (as is standard practice) measuring paints against theoretically ideal white at 100% LRV. Whilst values tabulated above clearly seem to be at or around 10%, the following renders illustrate the visual variance noticeable at the extreme ends of the scales, and these are compared with the currently recognised (distinct) shades of 507A and 507B. The physical sample of ADM 212/124 may be taken as instructive of the character of 507A; i.e. a dark grey with a bluish caste. This correlates with the pigmentation formulae given earlier comprising white, blue and black content. The sample appears to be slightly darker than intended and the blue appears to be neutralizing and shifting to green, but this would be consistent with aging of linseed oil based paints. The Snyder & Short 507A sample is slightly darker than the nominal intended value of 507A, whilst the 507B sample is significantly lighter. In conclusion, the available evidence (and there is more to follow when we examine G10) suggests that the intended LRV of 507A (and therefore of its sister 507B) was 10%, but that up to 13% was evident. The lineage of 507C is somewhat less confused than that of the 507A and 507B paints. The colour remained essentially constant from the mid-1930s until its use ceased after the second world war. 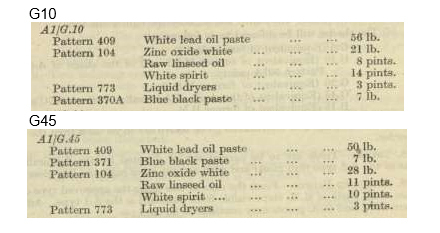 The pre-mixed blueblack paste used to make Pattern 507C Mediterranean Grey, or Light Grey, as it was also known, was different to that used for 507A, but no documents we have been able to obtain (which includes purchasing a copy of the defunct British Standard BS390 referenced in the Admiralty discussions) have ever revealed the exact composition of blue-black pastes, either pattern 370A or pattern 371, the latter of which was the one used in 507C. We can however refer to substitute mixes published by the Admiralty for use by ships unable to procure pre-mixed pattern 371 Blue Black Paste at their location using discreet black and blue pigments to arrive at the same shade. An example of this alternative is given in ADM 1/0002 New Zealand Station Memo NZ648/9778. From this, we can derive the proportions of blue to black in Pattern 371 Blue Black paste. Scaling down this formula to reproduce 507C has been carried out but requires extreme care. The simple ratio of 78lbs of white pigment to only 1.5lbs of black quite obviously means that when scaled down to sample quantities, the black contingent is both very small and extremely powerful. A very minor error in measuring out a small quantity of black pigment introduces substantial changes in the resultant tone of the paint. The authors did reproduce this paint using artists’ pigments, the stated liquid constituents and a set of precision digital scales, and the results support the extant samples in character of the shade. The Light Reflectance Value of 507C is described in various official documents including ADM 212/124, RE/CAM 30/1/1 and RE/CAM/N/8 with a value of 45%. At present, most with an interest in the Royal Navy around this time period will be primarily familiar with Snyder & Short’s 507C sample. This colour is generally considered reasonably accurate and characteristic of 507C insomuch as it is a cool, light bluish grey. It is however somewhat lighter than the documented values at approximately 52% Light Reflectance Value. This does not look out of place on models of ships of the pre-war Mediterranean Fleet in overall 507C which were typically photographed in very bright warm climate sunlight and reflecting a great deal of light. Keeping ships cooler inside in hot climates was indeed the reason ships were painted in 507C rather than 507B when on foreign stations such as the Mediterranean. A 507C at 52% LRV does however begin to be problematic when used as part of a camouflage scheme and leads to a great deal of confusion when interpreting black and white reference photos. Specifically, the contrast between 507A and 507C in reality was not so great as many currently believe, and furthermore such a light notion of 507C risks confusion with MS4a (LRV 55%). In short, we cannot interpret black and white photographs if our understanding of the tone of paints is incorrect. Whilst it is clear that both the G10 and G45 formulae again contain only white and blue-black pigments and thus are both bluish greys, we have found no documented evidence whatsoever suggesting the existence of an alternative shade of G45 with a warm hue, which requires a yellow and/or red component. However the key thing about these mixes is that the selection and proportions of pigments are identical to the 1941 onwards mixes for 507A and 507C resulting from AFO 4074/41 which reversed their pre-war quantities of white lead and zinc oxide, so G10 was 507A and G45 was 507C. The Snyder & Short colours are based upon original samples of the paints obtained by John Snyder & Randy Short. The authors have no reason to believe these have not been replicated faithfully. G10 sample measures slightly darker than specified, with a noted green content and very marginal blue component as compared to a perfectly neutral grey comprised purely of black and white. The G45 sample measures notably darker than specified with a relatively strong yellow content and noted green content. The Portsmouth samples have not darkened so much, but exhibit stronger green and yellow. Overall, the Portsmouth samples would appear to have degraded worse than the samples the Snyder & Short colours were matched to, although all have been affected by time elapsed since they were made. As we have seen from the formulations above, the ingredients used to produce both comprised linseed oil which darkens and yellows with age, lead white (which darkens and yellows with age), zinc white, ultramarine blue and black. Even if we assume that Section 9’s wording in AFO2106/43 was careless, it is clear that a combination of white, ultramarine blue and black pigments cannot make yellowish or greenish shades of grey. It is also widely known both in the paint industry and in the art world that both linseed oil and lead white are susceptible to both darkening and yellowing with age. Last month the Australian Government signed a $50 billion contract with the French company DCNS to build 12 new submarines. Keri Phillips takes a look at the history and future of war beneath the waves. Designs for military submarines go back to the 18th century, and by the turn of the 20th, several technological advances came together to give shape to the modern submarine. Developments in batteries and the internal combustion engine—powered first by petrol and then by diesel—made submarines much more reliable. The invention of the periscope allowed submariners to look out at what was going on from very close to the surface, while the gyroscopic compass allowed them to know where they were. ‘The Battle of the Atlantic was the longest campaign of the Second World War,’ says Goldrick, ‘and Winston Churchill said the prospect of losing it was the only thing that ever frightened him’. But the Germans didn’t win the Battle of the Atlantic, the Allies did. What was really important however was that it did profoundly affect the way the war would be fought, because the war was very much a war of resources, moving materials and weapons and people around the world. After the Second World War, submarines went nuclear, and during the Cold War gained a new strategic role. The US and the Soviet Union developed nuclear propulsion, which allowed submarines to stay submerged for much longer periods of time. Nuclear submarines were also larger and much more comfortable for those onboard. 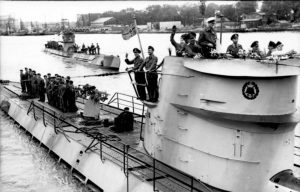 ‘The older diesel–electric submarines were cramped and uncomfortable and these conditions were alleviated to a great extent by the advent of nuclear power,’ says James Holmes, professor of strategy at the Naval War College in Newport, Rhode Island. ‘The associated systems that go along with that unlimited supply of power meant that ventilation is good and the ship can essentially cruise almost forever. In fact, our modern submarines only have to be refuelled once in their entire service life. This has been a major game changer in undersea warfare’. 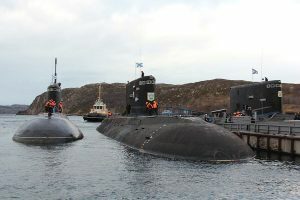 In addition to nuclear engines, submarines of the Cold War era could carry nuclear weapons, and became a pivotal part of the system of nuclear deterrence. ‘Basically you are putting your opponent on notice that if he strikes first, he is going to have a volley of nuclear ballistic missiles coming back in reply,’ explains Holmes. 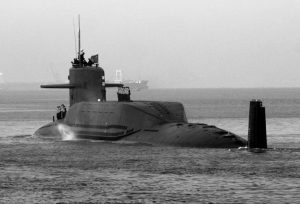 Submarines are expensive and, as we’ve seen with the recent selection of a French company to build Australia’s next fleet of subs, involve both international and domestic political sensitivities. Throw in nuclear weapons, and submarines will, it seems, always be controversial. ‘Here in the United States, the controversy is not so much the submarine itself but the fact that the financing for them is really, really difficult,’ says Holmes. ‘China has taken a little bit different vector as it develops its submarine fleet by continuing to rely on these diesel submarines, which are relatively cheap, can be built in bulk, can be armed with missiles and torpedoes, and can perhaps not defeat the United States Navy but at least give us a serious bloody nose and think twice about coming to the rescue of our allies in Asia. The following story was contributed by Hugh Hyland. Hugh worked for the variously named Defence departments for over 50 years until retiring in December 2015. He held numerous positions in NSW, France and WA: including Garden Island, Cockatoo Island Dockyard, and Fleet Base West. He also has Bachelor’s degrees in Naval Architecture and Mechanical Engineering, and a Masters of Engineering Science. In 1990 I was the Senior Design Engineer at ADI Garden Island, about a year after transitioning from a Naval Dockyard. On 15 August we were given a priority tasking to design the fitting of a pair of CIWS (Close In Weapons System) for DDGs in the lead-up to sending one to the Gulf War. These had never been fitted to any such vessels before and no plans existed, however I remembered discussing this aspect with one of the naval architects in Canberra a few years earlier, (who had since died). The suggestion was to replace the P & S boats and davits with RHIBS (Rigid Hull Inflatable Boats) and SLADS (Slewing Lifting Arm Davits), and install the mounts just aft of the IKARA magazines, the CIWS magazines being above 01 Deck and the CIWS mounts being above 02 Deck. On 17 August we conducted a ship-check on HMAS Brisbane. Two days later the Chief Design Engineer left for the USA for 17 days to chase up requirements from there. Daily meetings were called involving all the stakeholders. The decision was made to fully integrate both mounts with respect to the ship’s weapons systems. By 3 September there was still no Cabinet approval to fit CIWS, so the RAN actioned the fitting of one pair to HMAS Brisbane from available units, eg the set currently in the USA finishing upgrade and one of the mounts for the FFGs being built in Williamstown – to be completed by 5 October! Design drawings were fast-tracked in so far as the traditional rip-out drawings were replaced by using spray cans of yellow paint on board, and we made an engineering decision to use 20mm aluminium plate for the magazines on which the mounts would be installed before actually confirming with strength calculations. We were given till 7 September to complete these overall designs so that Production could start on the 10th. By the 19th, all but 4 of the drawing office staff were working on this project, with some (along with the naval architects and engineers) putting in up to 30 hours a week paid (and unpaid) overtime. The detailed designs were still to come, sometimes from on-board discussions and sketches in chalk on bulkheads and decks, where the drawing office would follow and prepare official drawings. We also used this opportunity to manufacture the magazine on one side using photogrammetry, which turned out quite well, in comparison to the traditional construction of the other magazine with “green” and scribing and trimming on the other side. The preliminary weight estimate was not able to be developed till 21 September. An inclining experiment confirmed there was sufficient stability with all the added topweight. This also included the fitting of IRST (Infra-Red Search and Track) and of radar absorbing covers along the guard-wires (which reportedly are very un-stealthy). Apart from commencing installation before there were verified designs, (we were literally working from our prior experience in naval engineering,) there were unknowns, for example potential interference from adjacent whip aerials, but there was no time to undertake the usual modelling – however shut-down precautions would be observed to ensure both mounts and whip aerials were not operating at the same time. Also there was no formal quality assurance, noting the lag in documentation and drawing, so reliance reverted to “overseeing” by key senior staff. The only aspect we could not achieve in the time was to set to work the Popup – so that if the mounts were facing aft they would not shoot the barrel of Mount 52 (the aft 5″ gun) if it was elevated outboard. The floodlighting on board all night every night was indeed a sight to see. As a further unsolicited service we worked out what to blank on the external ventilation inlets and dismantle on certain internal trunking so as to gain a fully recirculating gas citadel, albeit non-pressurised and without Air Filtration Units for fresh air makeup. We did this for both HMA Ships Brisbane and Sydney. On 15 October, both ships sailed one week earlier than originally programmed. Not only had we designed, fabricated, installed and set to work a pair of CIWS on a DDG as a world first, (and a pair of SLADS,) we also accomplished it in an amazingly short time, working 24/7, using experienced personnel and a minimum of paperwork. 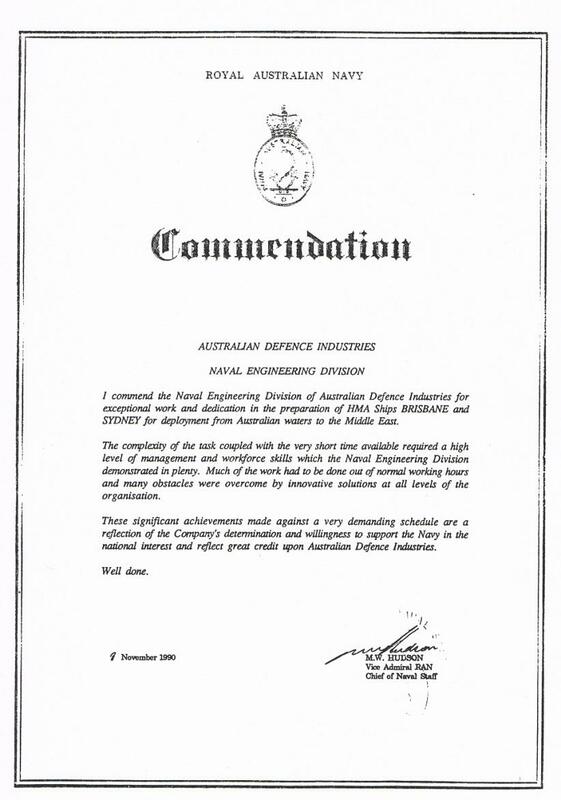 On 9 November Vice Admiral Hudson, Chief of Naval Staff awarded a Commendation to the Naval Engineering Division at ADI, see attached. The go-ahead to fit CIWS on the 2nd DDG, HMAS Perth, was received on 23 October. The 3rd and last DDG, HMAS Hobart, followed on.